Brunswick Billiards have made high quality billiards tables in America since 1845 and are still well known for their luxury items today. Their beautiful pool tables and games room products are hand-made by skilled craftsmen, using traditional techniques passed down through generations. The Brunswick games room range are highly sought after and are now exclusive to Home Leisure Direct in the UK. Their range includes pool tables, pool cue racks and accessory packs, shuffleboards, table tennis tables, poker & games tables, bars, and chairs & tables. They offer a Brunswick Authentic range, which are high quality games room products, hand made in the USA in true Brunswick style. 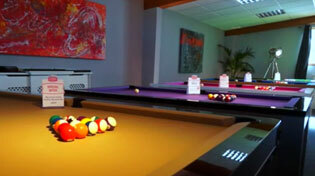 The Brunswick Contender range offers a more affordable range of games room products on buyers on a budget. The Brunswick pool tables are really popular American pool tables with two ranges, the Contender and the Authentic range, giving you a huge range of designs, finishes and price points to suit your needs. These fantastic pool tables have a selection of cue racks and accessories to go with them to match the style and finish of the table. We are extremely proud to be represent Brunswick; they have been building the world's best billiard tables since 1845. So when you invest in a Brunswick, you not only own the most beautiful, best-playing pool table in the world, you also become a part of this legendary heritage. Check out the links below for everything you’ll want to know about Brunswick pool tables from the History, to the differences in Contender & Authentic ranges. You can also see a pool table for each of these ranges in our showroom so you can see just how good they look in the flesh. Contact our friendly sales team for any further questions you may have. The Brunswick Smash table tennis tables are a popular choice for families too, as it’s an easy game for players of all ages and abilities to pick up and play, but a hard game to master. These tables are great quality, giving a game the whole family can enjoy and that players who want to take it more seriously can improve their skills on. Shuffleboards are really popular in the USA, especially for home games rooms and are now growing in popularity here in the UK. Although they’re long in size (12ft-16ft) they’re also thin, so many rooms commonly converted into games rooms, such as dining rooms, basements and garages, can easily house them. We’ve had many customers interested in our Brunswick range of shuffleboards recently, with the rise in people making their own home games rooms and are a popular choice among families, as they are great fun for all ages. Brunswick Billiards make a range of furniture to complete the Brunswick look throughout your games room. This varies from player’s chairs and tables, to bars and poker tables, so you can play in luxury, with a drink from your own bar and a comfy seat for when your opponent is playing or while sitting at your poker table.